Today, TPG Contributor Jason Steele looks at strategies for renting cars that can fit the whole family without breaking the budget. When I travel by myself, I have a simple formula for choosing which size rental car to reserve: I pick the smallest and least expensive car available. Rental car agencies rarely stock sub-compact cars, so if I decline the offers to pay for an upgrade, I often end up with a compact or mid-size four door car anyways. Otherwise, I’m happy to enjoy the improved fuel economy and ease of parking that comes with a subcompact. When I travel with my family, however, the equation becomes much more complex. Our family of four can squeeze into most rental cars just fine, so long as we travel light. On the other hand, we plan some trips with our children’s grandparents, and that requires more room. Sadly, reserving larger vehicles for a reasonable price can be challenging. In fact, I often find the rental price of a mini-van or a three-row SUV to be more than double the rate of an economy car! Here are some quotes from Expedia for a one week rental in Denver this winter. 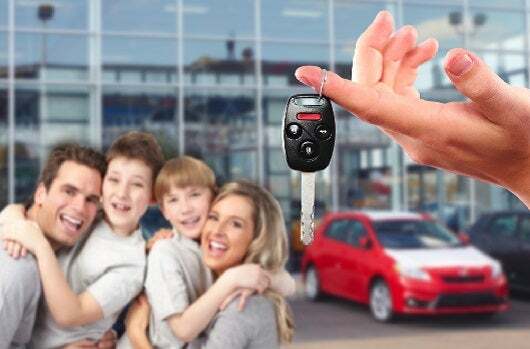 When trying to rent a mini-van, look for loyalty program awards, as they can offer tremendous value when redeeming points for larger vehicles. The compact car from my example above is a Chevy Cruze, which has a retail price of $17,520. The Dodge Grand Caravan minivan pictured above retails for $20,595 (only about 17% more), yet at best it costs over 100% more to rent, (and often much, much more). Compare that to the cost of a rental car award with the Hertz Gold Plus Rewards program. A weekend rental award for one day (compact to premium size) costs 550 points, but a specialty vehicle (which includes minivans) is only 50% more. So this is kind of like redeeming 50% more miles for a business class ticket that normally sells for over double the price of economy class. I recently purchased some Hertz Gold Plus Reward points during the Daily Getaways from American Express and the U.S. Travel Association. By redeeming these points for minivan rentals, I’m getting the most value possible per point, just like you do when redeeming miles for business class airline ticket awards. Another program that offers awards for larger vehicles is the National Car Rental Emerald Club program. Executive Elite members can use their free rental credits for for any car class except trucks and exotic vehicles, so minivans and full-size SUVs are fair game. Although this is a great benefit, reaching this status requires 25 paid rentals or 85 paid rental days in a calendar year. However, one year of Emerald Club Executive status comes with World Elite MasterCards like the Barclaycard Arrival Plus World Elite Mastercard or Citi AAdvantage Executive. 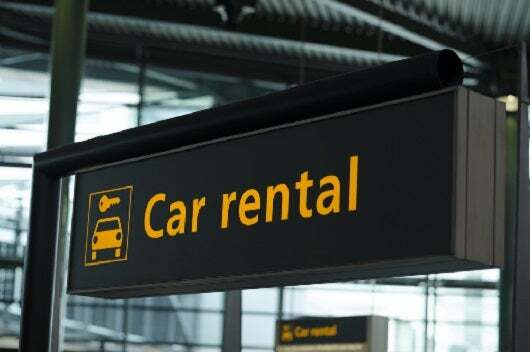 Unfortunately, other rental car loyalty programs offer rewards in the form of full-size vehicles or smaller, or tie rewards to the rental price of the vehicle, kind of like a revenue based frequent flier program. Most airline, hotel, and credit card reward programs offer some option to use your points and miles for car rentals. While having the option is useful, there are several problems with these types of awards. First, they return poor value per point or mile redeemed (usually only one cent or less). Reward travel enthusiasts typically strive to get at least two cents of value per point or mile; otherwise they’re better off earning miles with their credit cards in a fixed value rewards program such as Capital One Venture Rewards Credit Card or the Barclaycard Arrival Plus. Second, these awards tie the amount of miles or points needed to the price of the rental, so families can still end up paying more than double the cost of a sedan in order to rent a minivan or standard sized SUV. Finally, your credit card’s collision damage waiver will not cover a car rental just because you presented it when you were required to in case of damages. You actually have to pay for your rental car with the credit card, otherwise you’ll need to rely on your personal car insurance or purchase insurance from the car rental company. This is not an issue with Capital One Venture Rewards or the Barclaycard Arrival Plus, since you pay with your credit card, and later receive a separate statement credit. If you do choose to rent with points or miles, the best option is the Chase Ultimate Rewards program using points from the Chase Sapphire Preferred, Ink Bold, or Ink Plus cards. With any of those cards, Ultimate Rewards points can be redeemed for travel (including car rentals) at 1.25 cents apiece. I grew up in a family of five, and most of the time we ended up renting standard four-door cars and squeezing myself and my sisters in the back. As my sisters and I got older, it wasn’t very comfortable, but it got us from the airport to the hotel and on short trips to nearby tourist attractions. In cases like this, when a family can fit into a five passenger car, but would prefer something larger, there are a few options. Recently, I spoke to a business traveler who is a member of National Car Rental’s Emerald program, which allows Executive members to pick their own car from the “Emerald Aisle.” He was lamenting the fact that when he rented with National during busy times, all that was left for him were minivans. Despite (or perhaps because of) the high rate charged to reserve them, it appears that minivans are not in high demand, and are usually available to those who actually want one. So while I wouldn’t plan a trip for six or seven people and count on a minivan being available, the Emerald Aisle strategy would make perfect sense for parties of five. Emerald Executive status is a free benefit of the American Express Platinum card. Status is also available from MilePoint Premium memberships, and via a status match. Another strategy for five people is to try your luck with a mid-sized SUV, which sometimes cost less than minivans. For example, National lists their standard sized SUV as a “Hyundai Santa Fe or similar,” but only guarantees seating for seven if you reserve a full sized SUV. The Santa Fe actually seats seven, but other cars in its class like the current Jeep Grand Cherokee only seat five. To improve your odds of receiving a seven passenger mid-sized SUV, try calling the rental car location and speaking to a supervisor. You can ask them which vehicles they stock, and see if they have any way of reserving a specific type of vehicle for you. They might tell you that there’s nothing that they can do, but it can’t hurt to try. The Hyundai Santa Fe is classified as a mid-sized SUV, but it seats 7. When renting a car, you should always keep an eye out for coupons, some of which can offer two class car upgrades. Just be sure to check the vehicle class details for each company to see what counts as a mini-van or a full-size SUV if you have to have a seven passenger vehicle. Finally, the disproportionate pricing of mini-vans and 7 passenger SUVs seems to encourage families to rent two compact cars instead of one larger vehicle. This might be worth considering for two reasons. First, you could try to get a free or reasonably priced upgrade to a larger vehicle when you arrive, which is often an option. But if that doesn’t work, renting two economy vehicles might end up using about as much gas as a standard size SUV, while giving the family an option to split up for a day if they need to. Needless to say, this strategy works best in places where you won’t have to pay for parking. 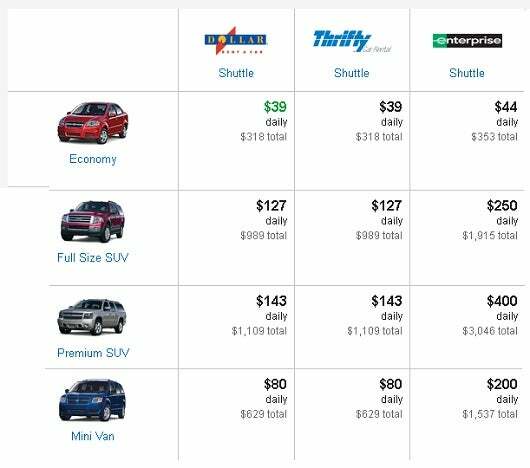 I’m waiting for a smart rental car agency to win over families by offering similar rates for minivans and mid-sized cars, since they cost about the same amount anyways. Until then, travelers will have to use every trick in the book to find rental cars that fit both their families and their budgets. If you’re interested in learning more about family travel strategies, Jason Steele and other gurus will be speaking at the Family Travel for Real Life seminar on August 23, 2014 in Sterling, VA (near IAD). Check the link for more details.